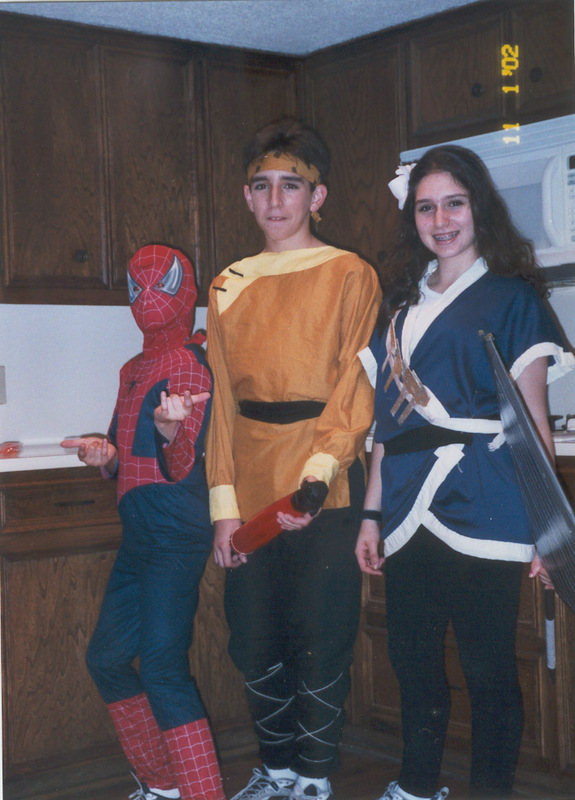 Angela and John as Ukyo and Ryoga from Ranma 1/2, plus Nick in a Party City Spider-Man suit. Way back in 2001, John and I were in middle school. We had loved Sailor Moon and Pokemon for years by then, and through our local comic book shop and our friends, we started watching other anime like Ranma 1/2 and Tenchi and Inuyasha. We LOVED it! We wanted to dress up as our favorite characters for Halloween, and for Austin's very first anime convention, Ushi-con! Back then we didn't have Youtube or costume tutorial websites or anything. We were on our own. So we found an old Singer sewing machine at a garage sale (which was so wonky that we needed channel-lock pliers every time we wanted to wind up a new bobbin) got our parents to take us to Hobby Lobby for fabric, and we taught ourselves to sew! We didn't know how to use patterns, so we did a combination of modeling off of our own clothes and draping and pinning things on ourselves. We were very determined! We made our own props, my giant spatula is made out of a metal pipe wrapped in athletic tape and cardboard wrapped in duct tape, John's umbrella we found at World Market and spray painted red. We were really proud of ourselves, and looking back, we actually did a pretty good job. 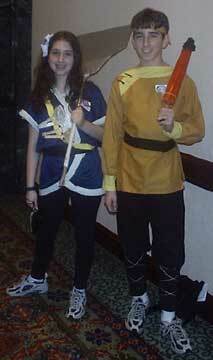 Considering that we were self taught 13 year olds who had never been to a convention before! People stopped and asked for our pictures and we had a ton of fun with our friends at the convention. Even with my braces and sneakers and wristwatch, we felt awesome and proud of ourselves. We went to Ushi-con every year after than until it was discontinued, and A-kon Dallas as well for many years when we were older. And 17 years later, we still love costumes and prop making and dressing up!